Local 878 announced today that we have contracted for an independent building inspection of the hotel in an effort to better understand the causes of mold growth reported during 2014 and to prevent its recurrence. 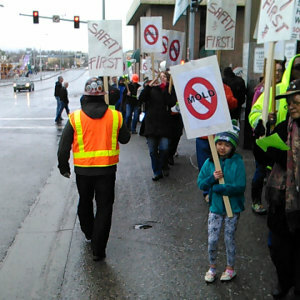 Visible and audible from the Fur Rondy Carnival on Third Avenue, today’s noontime rally brought dozens of local building trades workers in bright orange hard hats and Anchorage mayoral candidate Ethan Berkowitz to picket outside the Hilton. The State of Alaska office of Occupational Safety and Health cited the Hilton Anchorage in December for allegedly failing to assess the workplace for potential hazards and to select appropriate protective equipment for employees whose work could bring them into contact with mold. In January, the hotel settled the allegations and paid a fine without admitting wrongdoing. Hilton employees say a more thorough evaluation of potential causes of mold at the hotel is needed to prevent its recurrence. Representatives of UNITE HERE Local 878 note that testing conducted after the date the hotel stated repairs in affected guest rooms were complete indicated a continuing presence of mold in some areas. The hotel stated on October 10, 2014 that they had completed all repairs to 48 potentially water-damaged guest rooms in mid-September of that year. But on October 23—less than two weeks later—the hotel found an elevated mold score in a room listed as having been previously repaired. The hotel informed the employees through their union about the elevated mold score in the previously repaired room on December 3. Alaska Occupational Safety and Health also detected the presence of mold in some areas when the agency conducted sampling at the hotel on October 31. A group of workers at the Hilton Anchorage grew concerned last spring whether possible exposure to mold while working could potentially impact their health. Since then, the workers, the Hilton, and Local 878 have been in communication about what the Hilton says it has found while addressing mold or conditions conducive to mold. Last month, Local 878 requested access to the hotel by a building inspector. Federal labor law gives employees or their union the right to gather information about working conditions, including the safety of the building in which they work. Hotel management has agreed to cooperate. UNITE HERE Local 878, which represents over 150 employees at the Hilton Anchorage, executed its contract Friday with Cool Air Mechanical, Inc. of Anchorage to perform a building inspection at the Hilton Anchorage. A complete timeline of the workers’ complaints, state investigation, and hotel communications related to mold and condition conducive to mold growth at the Hilton Anchorage is available at www.moldreportak.org. Members of the Alaska State Legislature wrote to the owner of the Hilton Anchorage regarding the hotel’s recently settled State of Alaska office of Occupational Safety and Health citations and pledge to honor the ongoing worker-called boycott of the hotel. Signatories are Senator Bill Wielechowski (D–H), Senator Johnny Ellis (D–J), House Minority Leader Chris Tuck (D–23), Representative Scott Kawasaki (D–1), Representative Max Gruenberg (D–16), Representative Andrew Josephson (D–17), and Representative Matt Claman (D–21). Click here to download their letters to William Yung III, president of the Columbia Sussex Corporation in Kentucky. 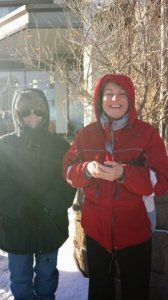 Employees who called attention to mold at the Hilton Anchorage have won an important battle in their fight for safety on the job. A group of workers at the Hilton Anchorage grew concerned last spring whether possible exposure to mold while working at the flagship downtown hotel could potentially impact their health. Some of them lodged a complaint with the State of Alaska Occupational Safety and Health office last May, which opened what turned out to be a five-month inspection. Over the ensuing months, AKOSH conducted three separate mold sampling protocols that “indicated the presence of mold to varying levels of count,” according to a December 12 letter the office sent to the union that represents Hilton Anchorage workers. AKOSH issued citations in December 2014, alleging violations of workplace safety laws focused mainly on hazard assessment and protective equipment. Finally, earlier this month, the Hilton Anchorage settled the citations with AKOSH. The settlement lightened the citations and penalties, while containing a limited non-admissions clause, but the hotel agreed to correct the alleged violations as modified by the settlement. Employees at the Hilton Anchorage have been asking potential guests to boycott their own hotel for the past six years because the company will not agree to a fair contract. The boycott is ongoing. Learn more about the worker complaint, safety inspection, and final agreement at www.moldreportak.org. Because Local 878 represents employees of the Hilton Anchorage, we would like guests to know about some important developments on the issue of mold at the hotel. On January 6, 2015, the Hilton Anchorage settled citations from the Alaska Occupational Safety and Health agency. AKOSH cited the Hilton Anchorage for alleged violations of workplace safety regulations on December 12, 2014, after workers had complained in May about possible mold exposure. At the time of the inspection (6/20/2014, 9/26/2014, and 10/31/2014), three separate sampling protocols were conducted at various times throughout the hotel. All sampling results indicated the presence of mold to varying levels of count. Citations have been issued. The AKOSH citations focused on the duty of the Hilton Anchorage to conduct a workplace hazard assessment and to select proper protective equipment for its employees. Hotel management disputed the allegations. As part of its settlement, the hotel agreed to pay reduced penalties of $2,145 and did not admit to violating the cited regulations. The Hilton Anchorage itself has acknowledged mold at the hotel. On May 6, 2014, hotel management reported working to fix 48 guest rooms where it found mold or the “possibility of water damage,” while indicating that air quality was safe. Over the following months, the hotel hired outside contractors to perform repairs on the rooms where it had found mold or the possibility of water damage. Hotel management reported on October 10 that repairs had been completed in mid-September. But then on December 3, 2014, the hotel disclosed that further testing on October 23 and November 12 revealed an “elevated mold score” in Room 1030. The hotel reported that it had taken the room out of service for remediation, again by outside contractors. For more information about what the Hilton Anchorage says it has done to address mold or conditions conducive to mold, or to leave a report on your own experience at the Hilton Anchorage, please go to www.moldreportak.org. You can also contact the general manager, Bill Tokman, at [email protected] or 907-265-7118. Workers at the Anchorage Hilton brought an atypical election-season issue to the attention of Senator Mark Begich as he visited their employee cafeteria Friday. A group of maids, bell hops, and other hotel workers are seeking resolution of a complaint they filed with the state’s workplace safety agency May 13. In that complaint, workers alleged that they lacked adequate training and protective equipment when working around mold at the hotel. Some workers reported allergy-like and other symptoms that they were concerned may be related to mold. “No one should have to worry about their health when they come to work. I take these concerns very seriously,” said Senator Begich. After the Anchorage Hilton reported on May 6 that it had found mold or possible water damage conducive to mold growth in 48 guest rooms, Hilton employees submitted a complaint on May 13 to the Alaska workplace safety administration, Occupational Safety and Health, alleging insufficient safety equipment, training, and knowledge of the issue to safeguard their health when they worked around mold. More than 12 weeks after filing their state complaint, workers were frustrated with what they say is a slow response. While the Anchorage Hilton has implemented what it calls an “aggressive” preventative maintenance program to address mold and moisture, workers want to ensure that proper training and protective equipment is included in that program. UNITE HERE Local 878 represents 1,100 workers in the hospitality industries of Alaska. Local 878 members work in hotels, restaurants, food service outlets, and laundries.